Go ahead, label Rango an animated vehicle for Johnny Depp driven by his Pirates of the Caribbean director Gore Verbinski. You wouldn’t be wrong, but you would be guilty of oversimplifying one of the most outlandish and downright weird animated movies to cross mainstream audiences in a long time. It seems almost mandatory at this point to acknowledge that Rango is indeed not a product of Pixar. However, it doesn’t come from Dreamworks either, but rather Nickelodeon. To this end, the bizarre twists and somewhat more mature material seem more at home. So too does Depp, voicing The Chameleon With No Name who later assumes the identity Rango when he stumbles into an Old West Town. He begins inside a rectangular tank, acting out various genre plays with an assortment of props. Throughout the film, Verbinski has that rectangle re-applied to his figure to show the audience that this Western shtick in a town called Dirt is one of his plays writ large in the semi-real world. This oddness works very well in the movie’s favor, shooting it through the sometimes mundane and mandatory trappings of the plot. This includes Rango taking on the role of sheriff and saving the town from dehydration, outlaw snakes, and a sinister turtle (Ned Beatty). Beatty recalls the notorious villain from Chinatown by planning to manipulate the town’s water supply, so much so that many will have to check the cast to make sure that it wasn’t the same voice. Big budget animated features like this are always marketed by the voices. Aside from Depp, Isla Fisher, Abigail Breslin, Alfred Molina, Bill Nighy and countless others all give inspired vocal performances. They voice a cast of various animals that poke fun at Western character archtypes- the sassy female, the wise Native American, the drunken comic relief. Aside from Nighy’s inspired performance as a rattlesnake with a machine gun rattler, it’s nothing too extraordinary. Nighy and Depp square off much like they did in the second Pirates movie, but here as outlaw reptiles. Identity crisis is perhaps the most common theme in any art form, yet it hasn’t been done to death. The sense of discovery, or refusal to do so must speak volumes to people, or mainstream films wouldn’t be so obsessed with it. Rango’s sublimely weird journey allows him to invent himself, and maybe even become himself. He ends up becoming his assumed role and filling in those imaginary shoes. The animation team behind this can be proud of the beautiful images. 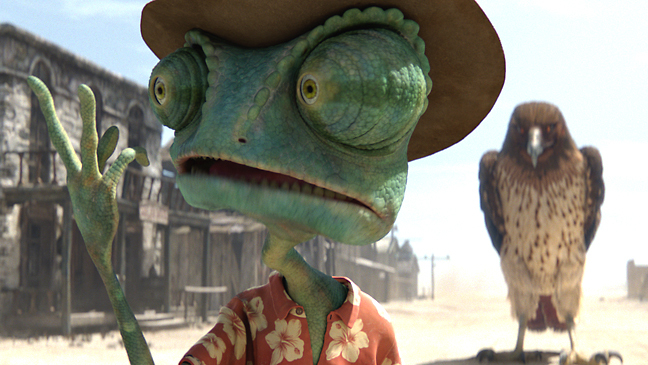 Rango is most at home in its weary hallucinations, especially one where the chameleon confronts an animated Clint Eastwood (voiced by Timothy Olyphant) dubbed “The Spirit of the West.” This humorous trip nods to Westerns as much as it does Fear and Loathing in Las Vegas. 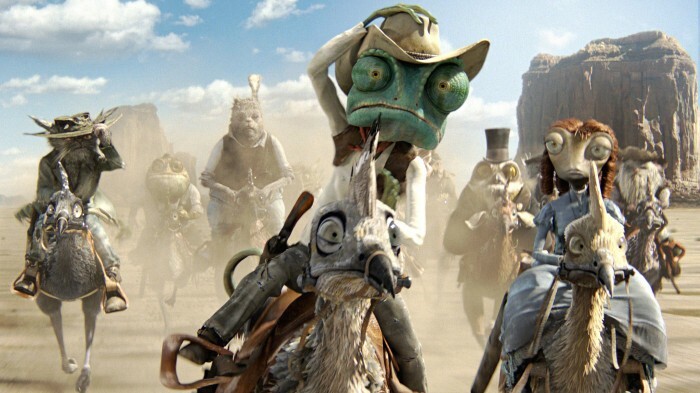 Rango has its share of exhilarating action sequences, the best of which has him and his gang fleeing a group of hillbilly ground rodents riding on a fleet of bats. This type of innovation may not quite give Pixar a run for its animated money, but it does show that there are other options out there. It may be an almost-too-perfect fit for Johnny Depp’s Gonzo obsession, but when you see such dull animation out there, a touch of the bizarre may be just the thing. This entry was posted in Reviews and tagged 2011 movies, Abigail Breslin, Alfred Molina, Animated movies, Animated Westerns, Bill Nighy, Clint Eastwood, Gore Verbinski, Isla Fisher, Johnny Depp, Nickelodeon, Pirates of the Caribbean, Rango, Reptiles, Talking animals, Westerns by matterspamer. Bookmark the permalink. Cannot believe how much I loved this movie. Could have used a slight trim on the run time but for a Nickelodeon movie I was thoroughly impressed. Good on a Verbinski! Stunning CG, great and epic chase sequences (yes the bat sequence was jaw dropping) and above all, well suited voice talent. Great character arc for Rango and is Rattlesnake Jake not one of the coolest villains in the last 10 years or what?!? Aces in my book and a BD buy for sure!